my teacher used it once for a pyshcological discussion and all I could think about was, "Hehe, Calvin and Hobbes"
Anyway, i'd have to say that, in a way, the last strip was my favorite. It was the absolute perfect way to sum up and conclude the series. I never thought before the fact that a comic strip could possibly bring me to tears. It takes a master to create such absolutely endearing and captivating characters, four black and white panels at a time (color on sundays). Incidentally, there is a great Calvin & Hobbes archives out there. My parents were always on me to groom myself and wear underpants. What am I, the pope?! Calvin & Hobbes is one of the greatest things ever created. i've owned all the books since before i can even remember and have read them all many times. i'm glad someone made this thread. but alas, they are all my favorites so i have nothing to contribute until i can think of a good one. The wonderful thing about this comic is that the humor works on so many levels. I started reasing C&H years ago and a lot of the jokes made no sense to me. I probably didn't even know they were jokes. I still loved the comic though becasue there was plenty of humor I did understand. Now though, whenever I go back and read one of my C&H books, I laugh out loud at so many things I never would have understood when I was younger. That's a sign of a brilliant comic writer if you ask me. If you can appeal to a very broad audience and still be very funny, but at the same time be wise, insightful, heartfelt, compelling, and endearing, you've really accomplished something great. Watterson is one of the few people I'm aware of that has truly been able to do that. the sunday strip where calvin and susie are playing doctor and the one where they are a married couple fighting about their rabbit-baby. they are both drawn in the style of old soap-opera strips, and are pretty much what i wish I could get my comic to look like. I think it's awesome how his tie is the black-and-red stripes of Calvin's T-shirt, and Susie's clothes are also the same colors she usually wears. yeah, i really like it when Calvin's dad tries to be smart and explain stuff he doesn't understand to Calvin. always classic. Incidentally, this strip was also published on the day that I was born. I have a particular fondness for all of the Spaceman Spiff stories. I hear Bill Watterson is living in the woods painting somewhere these days. Lucky man. I loved the Spaceman Spiff ones. Watterson pitched a couple of different strips before someone finally picked up Calvin & Hobbes. One of them was Spaceman Spiff. Watterson always loved Spaceman Spiff, and was bummed when he didn't catch on, but he turned up later as one of Calvin's alter egos. The one where he caught the baseball that he hit and says "I caught it! I caught it!....I'm out..."
Or any of the ones where Hobbes shows his more philosophical side. On a completely random side note, I have a tattoo of Hobbes. I am a nerd. Woo! 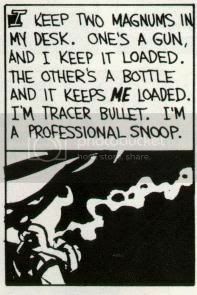 Any of the Tracer Bullet comics. I love all of the comics with the babysitter, because I have to look after a few kids who are like Calvin. Completely off the walls. The title strip (ha) from Homicidal Psycho Jungle Cat. Lol, I think my favorite one is probably the one when someone called for calvin's dad and he answered the phone. And the guy asked can you take a message? and calvin say's sure hold on. Then he blows up a paper bag and say's "AUGH!! I'VE BEEN SHOT" then hangs up and say's "I hate taking messages.." Sorry for lack of actual comic lol. My obsession with comics was caused by Bill Watterson. I bought a Calvin and Hobbes book whenever I got any money as a kid. In this past year I've discovered the sheer joy of re-reading old CH books with my adult, wikipedia-addled brain and finally understanding all of the jokes that I didn't get as a kid. I can't think of any strip that comes close to the universal appeal of Calvin and Hobbes, and it rivals Krazy Kat for the title of best newspaper strip ever. Needless to day, I'm having a hard time picking a favorite, though I always loved the ones where Calvin expressed himself creatively through the art of snowmen. Calvin's dad says they are having Monkey Brains (stuffed peppers I think) for supper. Mom says "Quit encouraging him!" Definitely a classic. I'm bummed. That searchable Calvin and Hobbes Database is defunct. Calvin: The secret to making great hot chocolate is to put the tiny marshmallows in first. Hobbes: So they melt faster? Calvin: No, so you can fit in forty or fifty of them. This way the hot chocolate just fills in the cracks. Hobbes: I wondered why you eat it with a fork. Calvin: Also, I don't use milk. I just heat the syrup. Calvin [to his mom, who is off-panel]: How's my peanut butter sandwich coming along? You're using chunky peanut butter, right? I won't eat smooth! [next panel] And make it an open-faced sandwich, too! Don't put any jelly on it or anything! And use some normal bread! I don't like those weird grain breads! [next panel] Did you cut it diagonally? I like triangles better than rectangles, so be sure to cut it right! Calvin: HEY! This is a closed-faced, horizontally cut, smooth peanut butter sandwich on weird bread with jelly! Weren't you LISTENING? Calvin: Aaugh! The peanut butter is ruined! [next panel] You're supposed to scoop one half straight down and then dig out the other side from the bottom, so part of the top remains undisturbed until the very end! Calvin's mom: What on earth for? Calvin: It's a ritual! You have to keep the top of the peanut butter smooth! Calvin's mom: Maybe you should make your own sandwiches. "Oh my god, you know what pants totally need? TEETH! Sharp, metal teeth, right at the crotch! And these teeth will be crushed together by a sliding wedge! Yes, this is totally what pants have been missing." It's not! He fixed it! Ooh, I like that site! One of the C&H books I have, It's a Magical World, is mysteriously missing strips from Sept. 4 - 28, 1995 (they weren't torn out, it was as if they weren't even put in the book in the first place) and I'd heard that Rosalyn played Calvinball with Calvin, and I'd always wanted to read that arc. I saved all the comics that are missing from that book (except for the Sunday comics, which for some reason were ones from the first years of the strip). i have always been a HUGE fan of the snowman house of horror strip. every time I get tackled, or tackle my son, I think of calvin ad hobbes. Spaceman Spiff was my hero. Incidentally, the search for "torment of existence weighed against the horror of nonbeing" gives over 200 results. John Milton was a punk rocker. I don't have a favorite strip (surprise), but my favorite kinds were always the wagon ones, the snowmen, and the spaceman spiff strips. Listen to SLOAN you CUNTS. My favorite ones where the ones that showed Calvin's kind side. Like when he found the baby Raccoon and it died. Or when he lost Hobbes. There are some basic rules to remember when cosplaying. 1. If you're a hot Asian chick you can wear whatever you want and say it's whatever you want. Lingerie and some Pikachu ears are totally a legitimate costume. 2. Everyone else needs to GTFO. Calvin and Hobbes is a great comic because it captures the essense of being a child so well, that you can't help but relate to it in some way. Everyone remembers the imaginary adventures that Calvin took part in because we all did that when we were kids. And this captures the emotion of childhood almost as good as anything I've ever seen. I had to add this one because I'm pretty sure that my dad had this look on his face until I turned 18. And yet, every once in a while, Calvin shows us just a hint that he's got more going on upstairs than your average ADHD kid. Calvin is just a genius... A... creative genius. And Calvin and Hobbes is probably the greatest comic that will ever exist. I don't say that about too many things and their particular subject, but I honestly think that this is the case. The art style is complex yet simple at the same time, there are jokes in each comic for just about everybody, and the comic just rings true. I've seen bears do things even a bear wouldn't do. I have a calvin and hobbes tattoo. I completely agree. The snowmen comics rock. I currently have an extra large jar of chunky peanut butter on my shelf with one half scooped straight down and the other side dug out from the bottom. <3 this comic. I recently downloaded the entire series, but only until i can scrounge enough cash to buy the boxed set. I do that with butter... That's close too, right? expecially Hobbes comment at the end. A little gross, I know, but I'm a simple man, with simple tastes. Thirded. Especially know that I've seen stuff like "Flash Gordon" and "Buck Rogers" and others and know where it comes from. But my all time favourites were his dinosaur ones. I was (still am) a dinosaur nut, so they particularly appealed to me. It's official, that is the greatest goddamn Calvin and Hobbes comic I have EVER READ. Hands down, the best comic strip of all time. I don't think it will ever be topped. A webcomic about books, music, romance, culture, and more. Alright you asked for it. Here are a few of my favorites. whoo, that was like work. Sorry to swamp the forum for my first post, but I thought you guys would like to read all these. Man, that was almost the best first post ever. I'm not sure who originally created this "modernized" Calvin and Hobbes, but it is damned depressing.